Powered by the popular Generation X engine, this liquid cooled motorcycle is built to last. Wide view mirrors, triple disc brakes enable this bike to manoeuvre through traffic effortlessly and safely. But this bike is more than just a commuter. It really comes to life on Tassie’s country roads away from the urban grid. With confidence inspiring ABS brakes and nimble front upside down forks, the fun starts when you press the start button. Call in and check it out today. 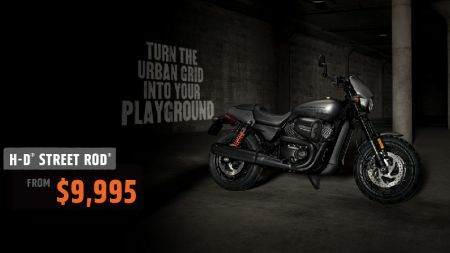 Plus with a demonstrator model available, you can twist the throttle and find out for yourself what this model is all about. Positives: While not a traditional Harley® it is certainly a breath of fresh air in a modern crowded world that stands out. Negatives: Hard to pick a negative. At this price they won’t last long so head in and place your order. Pro Tip: Check out the accessories catalogue, there are plenty of products to personalise your new ride!